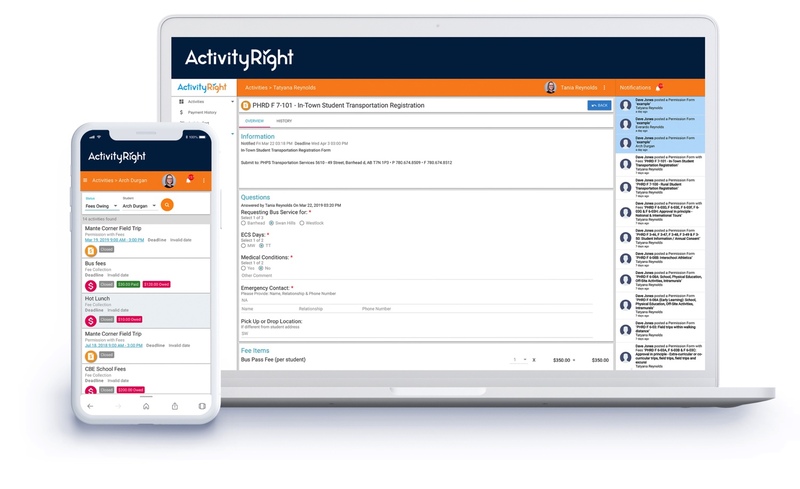 ActivityRight is the centralized engagement platform that integrates with your existing data to enable peak communication in the mobile-friendly format your staff and parents expect. No more tracking down parents, payments, or approvals. 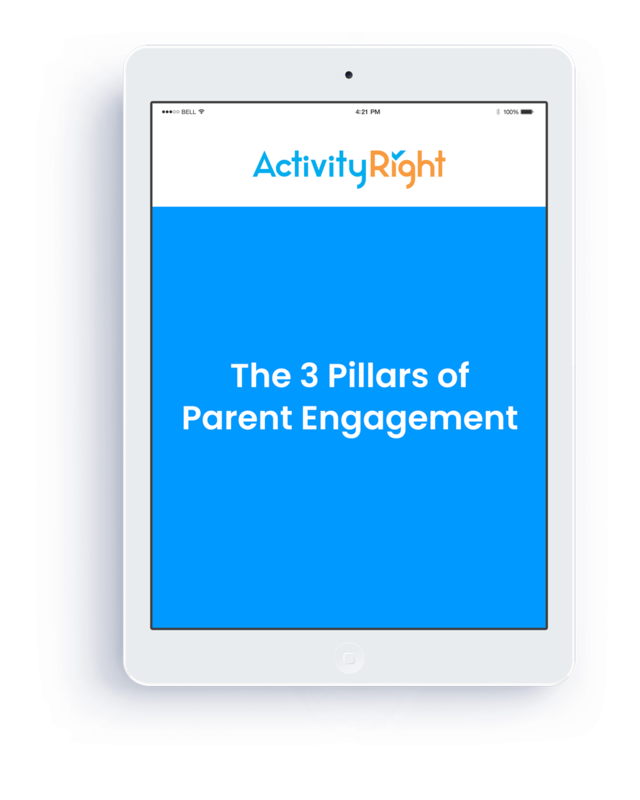 ActivityRight helps your district reduce admin work and increase family engagement. Make it easy for staff to meet form-based compliance requirements, improve communication and collaboration, and avoid cash misappropriations. Pair ActivityRight with your existing systems, including SIS and accounting, and watch as staff adoption increases while troubleshooting requests decrease. Integrate ActivityRight with your general ledger and cash management process, automate fee collection and reconciliation, and program forms to meet policies. Give parents insight into their child’s education with real-time notifications and the ability to make secure payments when and where it is convenient for them. Eliminate paperwork and stay organized. InviteRight, our event ticketing system, allows you to focus on executing the perfect event, every time. Take the headaches out of notifications, payments, approvals, and security. Streamline field trips, events, and other school initiatives by solving all the problems that come with forms. 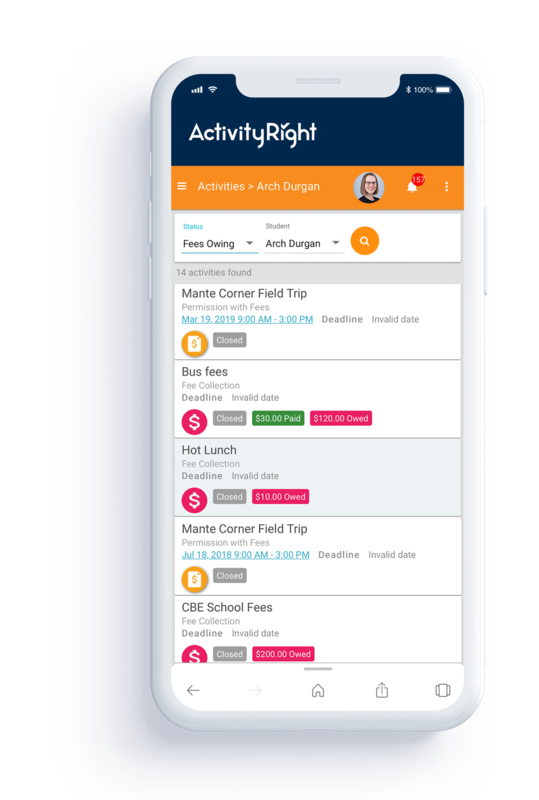 Easy for staff to manage and easy for parents to access, ActivityRight is your hub for all school and district activities. Focus on what matters most: creating positive student experiences. Goodbye tedious manual processes. Templates and automated workflows let teachers easily create processes applicable to their activity while complying with school and district guidelines. Payments are handled securely by ActivityRight, so you can remain hands-off during the payment process, too. Improve your school communication plan with mobile-friendly messaging. Give parents the anytime/anywhere access they want. 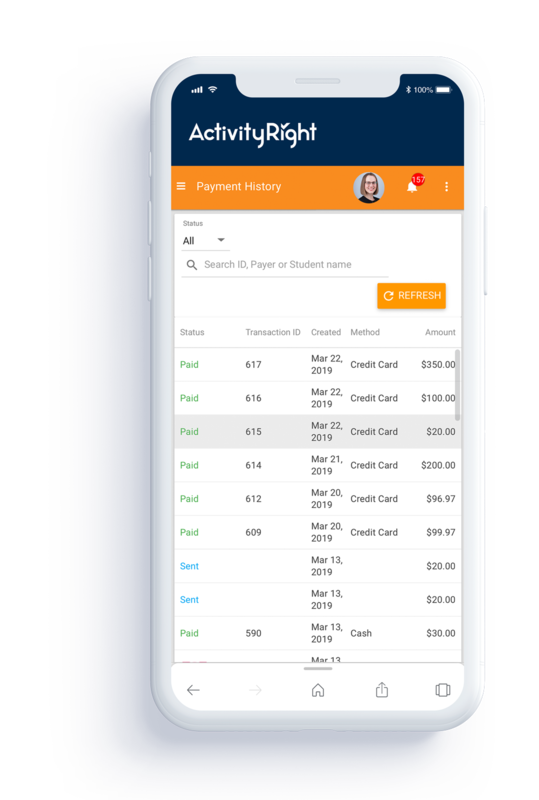 ActivityRight allows parents to pay school fees from any device, schedule meetings, and more, with all data encrypted and communicated within a secure socket layer (SSL). You can also automate reminders and announcements, including violence and emergency notifications that help you meet OSHA standards. Accurately allocate school-generated funds and avoid misappropriations. The financial visibility you need, with reports built for teachers, schools, and districts. With ActivityRight, your online payments are fully auditable and able to integrate with your accounting software. Our team has been working diligently for over 20 years to make compliant parent engagement easier on district administrators. 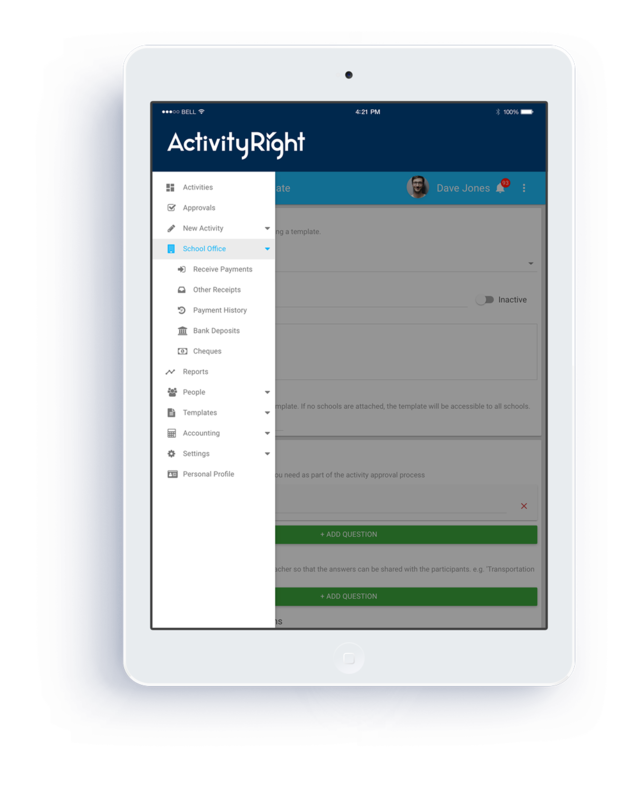 ActivityRight is a mobile-friendly parent and fee management tool that was built with district needs in mind. Up and running fast. Mobile-friendly and intuitive, ActivityRight requires minimal training, but if you ever need extra support, our team is there for you. SIS and GL integrations mean less manual work for you and more up to date data. Paired with ActivityRight's reporting abilities, you'll have it all at your fingertips. You shouldn’t have to chase missing paperwork or outstanding fees. ActivityRight automates necessary administrative tasks to let you resume the high-impact parts of your job. ActivityRight has the support you need, when you need it. Our team has the educational expertise needed to fully understand and solve your challenges. Creating and sustaining meaningful, two-way communication with families takes work. But when parents are engaged, student academic performance improves, parents find it easier to help their children, and staff enjoy more positive relationships with both. Develop a strategy for finding out what parents really want, communicating with them via their preferred methods and devices, and keeping a beneficial dialogue going for the whole year. See how ActivityRight can help you, your school, and your district. Receive our experts’ latest insights on parent and family engagement and fee management. ActivityRight and InviteRight are members of the TransACT family of brands. We have proudly been serving the K-12 community for more than 20 years. To learn more about our host of engagement, compliance, and payment solutions see: TransACT, 21CCLC, McKinney-Vento, CampusRight, & OneCampus.